Your dining guide for self-dating in Winnipeg. A recent article on the CBC got me thinking about sushi. It sounds like a good chunk of these restaurants in Winnipeg was using an unlicensed guy to hire Korean workers. While that's kind of sketch, it isn't inherently exploitative BUT at least one of these restaurants made their staff hand over a good chunk of their wages, which is just sick. Pay your staff, srsly. To my knowledge the restaurant(s) that did/do this have not been made public, but if you know who they are, please share. There's a ton of sushi in Winnipeg and I'd really like to frequent those establishments that pay their staff. Call me a crusader. ANYWAY, one of my fav solo sushi dates is at Naru Sushi. It's on the way home/to a lot of places from where I live so the convenience of location probably plays into that. The service is really great too and accommodating for a solo diner such as myself, so I sincerely hope that the owners don't skim off the servers' (or kitchen staff's) cheques. If it ends up being the case, I can content myself that the experience isn't quite as good as it once was; they've axed their shrimp gyoza and the nigiri has been a bit dry. As is fairly typical, they use 'crab stick' for their California rolls, but you can upgrade to real crab for a slight charge, which is a nice option to have. There's nothing terribly special here for booze, so I don't make this an alcoholic night out since wine and beer is something you can get anywhere. But if you're the kind of person who abstains, there are some fun 'kid-friendly' virgin drinks available. I had the Pineapple Spumoni (pineapple, grapefruit, pop) which was a nice alternative to getting a Coke. 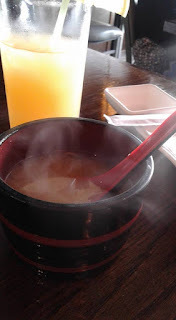 I usually go with tea with sushi since that seems to be the things to do, but it was a zillion degrees Celsius in Winnipeg that day, so a cold drink seemed to be in order. That said, their hot dishes at Naru are pretty great. I have to get miso soup or I feel like I cheated and theirs is just as good as any. I really dig their sushi pizza; raw salmon is one of the best things to serve with avocado and the rice patty it's all on is not too thick and nice and crisp. If you're not sure what to try, give that one a go. It'd make sushi purists gag, but it's worth it. One of the reasons I love sushi as a solo-date is you can get nigiri in single orders/the rolls are usually small enough that you can get a couple different ones without stuffing yourself to the max. As I've mentioned before, I don't have a huge appetite, so I definitely go for variety over quantity when I take myself out for dinner. Naru in particular has great combo trays for one. My go to and the one I got on this visit was the 8 piece sushi, California Roll, and a miso soup. As I said, the nigiri has failed to live up to what I was used to getting and I'm always a little disappointed when they don't identify what the fish is when you order a 'chef's choice' kind of combo. That said, the server might have just took my confidence in ordering as a sign that I could tell what I was eating by sight (which is half true, but beyond the tuna, salmon, and ebi, I have no idea). Naru is a pretty small place, so I recommend making this spot a weeknight dinner venture so you don't feel too guilty taking up the space that a larger party might need. If you live in the Village, it's a solid stop-off before or after some grocery shopping, if you're walking to the Safeway or Vita Health.